I managed to avoid kimchi for the greater part of my life. My mother always had some in the fridge, and it was one of the first aromas that would hit me whenever I opened up the door. This was not a pleasant experience. Several years back, though, in the heat of the summer, a Korean-Japanese friend of mine named Ko whipped up a huge pot of kimchi chige soup. I thought he had lost his marbles. Who in their right mind would want to eat a steaming bowl of spicy kimchi soup? Ko had worked hard at making it, however, so I asked for a very small bowl. While it was hot and spicy, it was rich in umami and had a lot of depth to it. Beads of sweat congregated on my forehead, but I went back for more. It was almost masochistic, but I was converted. And shame on me for those lost years of enjoying this Korean treat. While I cannot turn back the clock, I can have as much kimchi as I want now. Here are some ideas to warm you up in the cold of the winter. Kimchi on its own is a great beer snack, or served simply with a bowl of steaming rice. Many different vegetables are used to make the dish, and each one contributes to the finished product. From daikon to hakusai (Chinese cabbage), cucumbers to bean sprouts, its the variety that keeps you coming back for more. And, best of all, there are so many varieties available at your local supermarket - or if you are really into it, then explore the Korean grocery stores in Shin-Okubo. While you are at the shops, pick up some kochujan, which is a sweet and spicy bean paste. It is not at all like miso, so dont use it as a miso substitute in these dishes. Kochujan will give your cooking more depth, and the sweetness will help to round out the heat from the kimchi. If you make fresh spring rolls, you can add a schmear of kochujan; its also good added to marinades if you barbecue meats at home. 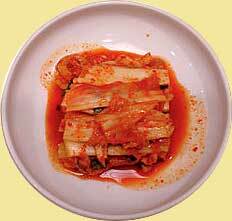 The easiest and most addictive dish is buta kimchi, with thinly sliced pork. If youre in a rush, make it into a donburi and pour the buta-kimchi over a large bowl of rice for a one-dish meal. When I have friends over for a nabe party, the kimchi nabe is one of the most popular. This dish is similar to buta-kimchi, but it is rounded out with nira (garlic chives), hakusai, shungiku (chrysanthemum greens) and tofu. As a nabe it will need a liquid broth, so I like to add kombu dashi and some kochujan. Another idea is to chop up some kimchi, mix it with natto, and garnish with sesame oil. While the kimchi takes away some of the stink of the natto, it results in another type of funky smell. You can add that to an omelet - ideally on the weekends when you dont have any meetings. Next time you make fried rice, add some chopped up kimchi, ground pork, garlic, pine nuts and nori for a kimchi chahan. Incorporate a bit of the kochujan at the last minute to round out this dish. If you roll your own sushi at home, a great combination is kimchi, cooked spinach and the omelet. Homemade kimchi and pork gyoza are a nice variation on the classic dumpling. For the stuffing, try ground pork, chopped kimchi, an egg yolk, minced green onions and sesame oil. A new shop in Daimon named Sonamu offers Korean katei ryori (home cooking). The kimchi is made from scratch and incorporated into many dishes, such as buta kimchi and dekitate maze kimchi, a salad with hakusai. Theres also a seasonal one-pot dish with the charming name saru no nabe. Its packed with seafood, kimchi and topped with gnocchi, pasta and cheese. While I used to abhor kimchi, I now adore it and cant get enough. Like mother, like daughter - the food now has a permanent spot in my fridge. If you, too, have shied away from kimchi, this may be the time to give it another chance, especially seeing how versatile it is in the kitchen.